Originally published in 1956, A River Called Titash is among the most highly acclaimed novels in Bengali literature. A unique combination of folk poetry and ethnography, Adwaita Mallabarman's tale of a Malo fishing village at the turn of the century captures the songs, speech, rituals, and rhythms of a once self-sufficient community and culture swept away by natural catastrophe, modernization, and political conflict. Both historical document and work of art, this lyrical novel provides an intimate view of a community of Hindu fishers and Muslim peasants, coexisting peacefully before the violent partition of Bengal between India and East Pakistan (now Bangladesh). Mallabarman's story documents a way of life that has all but disappeared. Adwaita Mallabarman (1914-1951) was born near the river Titash in the Comilla district of Bengal (now Bangladesh). He was an editor and writer until his death at age 37 from tuberculosis. 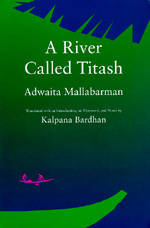 Titash Ekti Nadir Naam (A River Called Titash) was published five years after his death. Kalpana Bardhan is a research associate at the University of California, Berkeley, Center for South Asian Studies. Her translation of Bengali short stories, Of Women, Outcastes, Peasants, and Rebels, was published in 1990 by California.